Traditionally, marriage was not so much a ritual between a man and woman to sanctify a loving partnership, but actually the formalization of a contract between families. While this tradition has waned in modern Korea, marriage is still as much about two families as two individuals. Sharing of food is a sure way to foster the bonds, or “jeong,” needed to placate any in-law in-fighting, and it is probably for this reason that lavish feasts are essential to weddings the world over. Jeju is no different, and villagers here traditionally came together to prepare and share food, some giving rice or mixed grains, while others gave chicken or eggs. In this way food became a crucial part of wedding celebrations. Weddings in other Korean regions are dominated by traditional sweets, cookies and rice cakes. In Jeju, however, pork is the main dish, and in the old days engaged couples began raising pigs for the big feast two to three years beforehand. 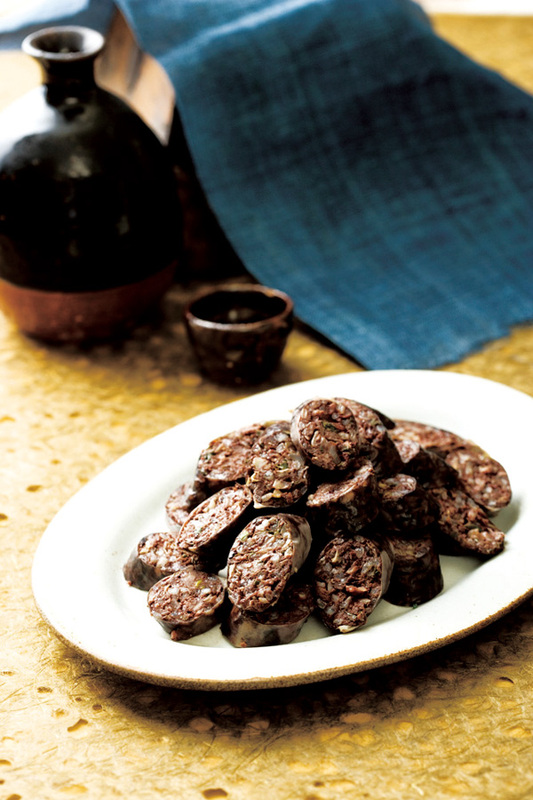 One of the main pork dishes is sundae, which is similar to blood sausage or black pudding. Sundae is pig’s intestine stuffed with a mixture of pig’s blood and buck-wheat flour, boiled in a broth of pork stock and seaweed. Another favorite is boiled pork, or “suyuk,” not only a wedding food but the leftovers of which were used for villagers’ soup, increasing the sharing between in-laws, families and relatives. There was even a woman called the “dogam” who would cut pork all day in preparation, with the killing of the pig signaling the start of the celebrations. Jeju weddings to this day remain domi-nated by pork dishes, but if you have not received an invitation to taste these for yourself, here is a simple recipe to make your own. 1. Wash and salt pork intestine, turn inside out and place in water. 2. Mix pig’s blood, buckwheat flour, chopped leek, crushed garlic and salt until a crumbly consistency that runs through your fingers. 3. Stuff two-thirds of intestine with this mixture, placing a fresh egg in each end. *If intestine is packed too tightly or boiled too strongly, sausage will burst; to prevent this, prick sausage casing with fork or chopstick. 4. Boil at 85 to 90 degrees Celsius until sundae floats.